I spent the weekend at the Yosemite Bug, a mountain hostel 20 minutes outside of the Highway 140 entrance to Yosemite. On Saturday, a group of us hiked to Vernal Falls. With all the rain we had this winter, the waterfalls are huge. The hike began at Curry village in yosemite, and we climbed a very nontechnical trail (paved at some points) for about a mile and a half. After crossing the creek before the falls, we made a sharp left turn and began a steep ascent up to the falls. We climbed steep steps carved into the granite and made slick by the heavy mist coming from the falls. It was still fairly easy, but precarious enough that everyone double checked their footing as they climbed. The view from the falls was spectacular. Vernal Falls drops a good 100 feet into a steep rocky creek that eventually becomes the Merced River (more on that in the next post). 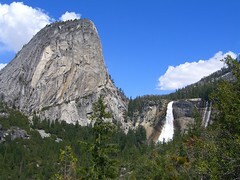 Many of the smooth granite peaks that characterize Yosemite were still capped with snow. The sky was a deep blue and clear except for the occasional pillowy white cloud. After lunching and sunning ourselves at the falls (I also wandered and worked on some traverses on the boulders in the area) we split up into two groups. One continued on up to Nevada falls, while the other (my group) hiked over to the John Muir trail and descended back to curry village. Just as we were approaching the bridge that crosses the creek below the falls, Yosemite Search and Rescue closed off the bridge to all foot traffic. Apparently there was a rescue in progress a little further down the trail. I never got any details about what happened, but there were also a couple ambulances at Curry Village. I hope no one was seriously injured. As we milled about, wondering if we should wait or descend by an alternate trail, Reba exclaimed, "Bear!" Sure enough, ambling down the trail came a fairly large brown bear. It wandered around the opposite side of the shore for several minutes, allowing everyone to take tons of pictures. I don't have much of a zoom on my camera, but hopefully some of my fellow hikers will email me some better shots. After the bear left, we decided to descend by the alternate trail. The hike was uneventful, except for a moment where I slipped and almost fell into the raging creek 30 feet below us. I was being careless and imitating a tightrope walker along the edge of the trail. Luckily I am still here. We had planned on doing some bouldering at Camp IV, but it began to rain and we were all pretty tired, so we decided to return the next day for bouldering instead. We returned to the Bug, ate a delicious steak and trout dinner, and stayed up 'til the wee hours of the morning singing and playing guitar around a campfire.